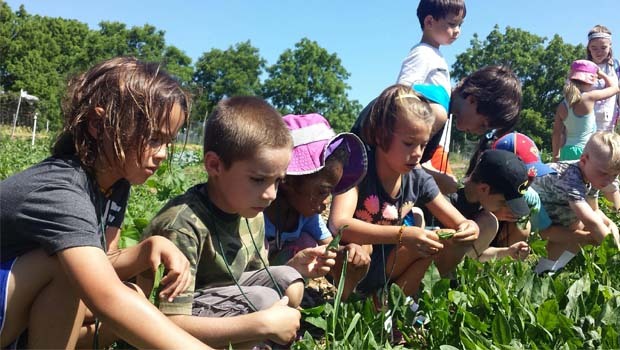 MSU Extension Tollgate Farm Summer Camps 2019 – The 160 acre MSU Tollgate Farm in Novi hosts hands-on, summer nature programs and summer day camps for kids ages 6-14 through the MSU Extension program. Camps engage the kids using STEM projects, nature, and fun! Each camp provides new adventures and different theme. A typical Tollgate Farm camp day includes making snakes in the Garden Kitchen, taking care of the farm animals, gardening, taking part in a week-long STEM project, and exploring the fields and ponds. By allowing campers to “do, reflect, apply”, young people are empowered to be in charge of their own learning, instilling a passion for self-directed, life-long exploration. All camps are farm-based and fun-filled. Day camps run from 9a-4p with 4p-6p aftercare available for an additional fee. Drop-offs for the day camps start at 8:45a. Stewards ages 15-19 years and Stewards-in-Training programs for ages 13-14 are available (see below). Multi-child discounts are available. Low child-to-adult ratios make camp weeks fill quickly, so register early. Tollgate’s flagship camp, Green Science Adventure is a great taste of life on the farm. Spend our days feeding critters in the barnyard, tracking animals in the forest, playing cooperative games, and preparing garden fresh snacks that campers helped grow. This version of level 1 Horse Camp will explore the wonders of the equine body. Campers will dive into the anatomy and physiology of horses, explore specimens under a microscope, learn about veterinary procedures, and much more. Campers will also work on basic horsemanship skills, acquire horse husbandry knowledge, and experience the day-to-day operations of a working farm. You do not need a horse to participate. Spaceship Spartan 1 has crash-landed on Planet Tollgate and the crew must find a way to survive until help arrives. Young astronauts attending this camp will test their survival skills with fire building, archery, fishing, wilderness first aid, shelter building, orienteering, garden kitchen, animal chores, and more. Interstellar-based adventures will encourage campers to engineer their way through survival situations and learn about the solar system. Take Survival Camp to a whole new level and challenge yourself with new and exciting skill building experiences. Test your limits and develop a survival mindset with map reading and orienteering, fire building, outdoor cooking, shelter building, rockclimbing, trust initiatives, an optional Thursday campout under the stars, and other outdoor adventure challenges never before offered at MSU Tollgate. Investigate animal behavior and how animals in the MSU Tollgate forest, fields, and pond play an important role in their ecosystems. In addition to daily farm animal chores, adventures take campers beyond the barnyard to discover the diverse habitats of wildlife and the creatures who live within. Discoveries, collaboration, and play are in store for this fun-filled animal-focused week. Tollgate has banded together with Kellogg Biological Station in Hickory Corners, Michigan to offer this exploration of wild and domestic birds through interactive, hands-on science activities. Become an ornithologist to study birds and their amazing feats as we hike the fields and forests of MSU Tollgate Farm and KBS. Meet at Tollgate for farm-based birding adventures Monday and Friday. As field scientists, camp out under the stars at KBS Tuesday through Thursday to interact with research scientists, meet raptors up close and personal, make new friends, and have lots of fun. Transportation and tents provided. Explore MSU Tollgate through the ages as you try your hand at homesteading skills of farmers from the past, the present, and…the future. Tackle farm-based skills of gardening, animal husbandry, carpentry, cooking and canning, candle-dipping, fiber processing and arts, composting, and companion planting. Campers try cart-pulling, harvesting, and plowing. Put technology to use and look into the future as you investigate sustainable agriculture themes of resource management and environmentally friendly practices. Take a trip with us to colonial America when horsepower meant actual horses. Discover how horses were used before farms had trucks and tractors, and even practice skills like plowing and driving. Experience life before modern-day technology. Campers will also work on basic horsemanship skills, acquire horse husbandry knowledge, and experience the day-to-day operations of a working farm. Eco-Warriors is perfect for those who like to tinker, engineer, craft, and change the way we think about trash. The week will include calculating our eco footprint, exploring pros and cons of renewable energy, repurposing items in our makerspace, and taking a field trip to the Resource Recovery and Recycling Authority. Learn from the MSU Sustainable Agriculture Team about closing the food waste loop, prepare, and eat locally grown snacks, and consider the impact of our resource use in agriculture. For kids interested in engineering, science, biology, nature, and fun. A week of exploration and challenges geared toward learning about aquatic ecoystems of southeast Michigan. Come and create a fully submersible ROV (Remotely Operated Vehicle) while learning engineering concepts, problemsolving, design skills, and teamwork: Explore buoyancy/displacement, propulsion, soldering, tool safety and storage, electricity circuits and switches, waterproofing, depth measurement, biological sampling, invasive species, and more. Dive into the world of the pond to investigate the animals, bugs, and plants that call it home. This week is perfect for the camper who is interested in fishing, canoeing, and pond dipping for macroinvertebrates. Learn about water conservation and water ecology. The week closes with the return of the famous water slide for a splish-splashing good time. English-style horseback riding. Campers will dive into the world of horse racing, jumping, dressage, and learn about their impact on the world today. Enjoy the horses up close and personal as you gain English riding skills during your equine adventure on the farm. Campers will expand their horse husbandry knowledge and experience the day-to-day operations of a working farm. Campers do not need a horse to participate. Campers must have attended a MSU Tollgate Level 1 Horse Camp in order to register for Level 2 Horse Camp – English Riding. Participate alongside other young cooks in Tollgate’s junior top chef food challenge. The week will include digging into the concept of farm to table, caring for the animals, and exploring the surrounding field, forest, and pond. We will interact with goats and greens as we engage in food science making nutritious snacks that taste yummy. Campers will grow, harvest, and cook with MSU Tollgate farmers each day as we build our sense of food community and fun. Campers will learn what it was like out west in the days of cattle drives, campfires, chuck wagons, and more. Explore the different western events and try your hand at roping, barrel racing, and many other ranch activities. Enjoy the horses up close and personal as you gain Western riding skills during your equine adventure on the farm. Campers will expand their horse husbandry knowledge and experience the day-to-day operations of a working farm. You do not need a horse to participate. You must have attended a MSU Tollgate Level 1 Horse Camp in order to register for Level 2 Horse Camp – Western Riding. The Tollgate Camp Teen Steward (15-19 yrs) and Tollgate Steward-in-Training (13-14 yrs) positions are for those interested in gaining experience working with campers in agriculture and natural sciences. This experience offers a chance for stewards to enrich, mentor, and lead campers while gaining valuable leadership and life skills. Stewards must commit to at least two full weeks of camp.